With all the problems with bringing a new Wonder Woman show to television, maybe it's time to consider some other classic 1970s TV superhero women instead. 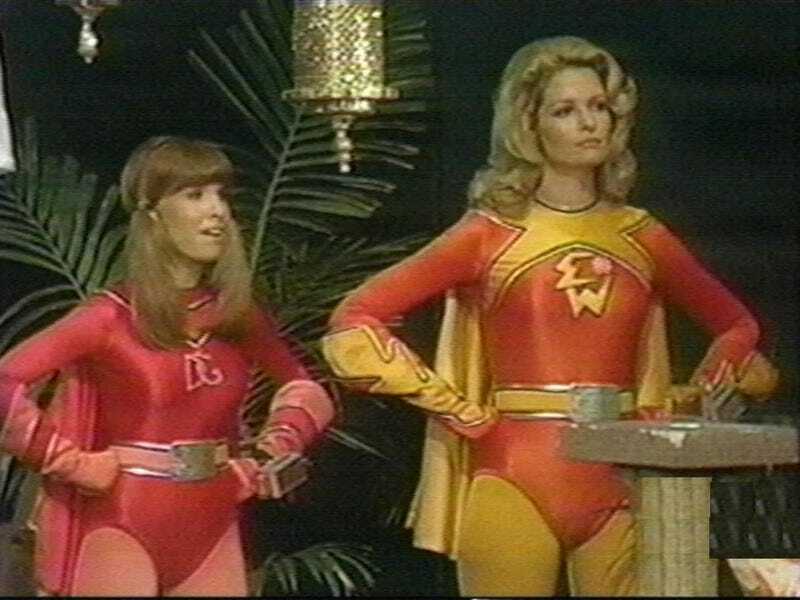 Those of us old enough to remember the nightmare fuel called The Krofft Supershow also remember the Electra Woman and Dyna Girl segments. The show was obviously heavily influenced by the '60s Batman show - caped crime fighter with youthful sidekick, gadgets, secret base, over-the-top villains. The hands-on-hips pose in the top image was used as much as possible. Being an adolescent boy when the show aired, I couldn't help but love it. The WB tried to make a new version of the show in 2001 as a parody set years after the original. Markie Post played Electra Woman as a bitter alcoholic fallen on hard times. Rebooting Electra Woman and Dyna Girl should be an easy sell to network executives ("2 women in tight costumes playing superheroes"). There's not a lot of backstory to the characters so you could do whatever way you want - dark and gritty, superhero parody, CW teen drama.